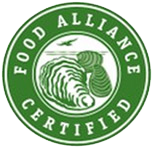 Food Alliance certification for farmed shellfish provides a trusted and independent third-party audit process for certifying socially and environmentally responsible management practices in shellfish farming operations and and handling facilities. Intern or volunteer on one of PSI's research projects or outreach campaigns. Each year, thousands of residents and visitors flock to ocean beaches and estuaries with shovels, rakes and buckets in hand to take part in the West Coast's vibrant bivalve shellfish sport fishery. In most states, recreational shellfish harvest is only permissible in designated public harvest areas and requires recreational harvesters to obtain a license prior to harvest. Maps of public harvest areas and information for obtaining necessary permits can be found online. Washington State is unique among the West Coast states in that it allows for private ownership of tideland areas. Private tideland owners are able to harvest bivalve shellfish from their beaches without a license and can even participate in small-scale, non-commercial shellfish aquaculture or "gardening" to grow shellfish for personal consumption. Shellfish can sometimes be unsafe to eat for a variety of reasons and it is very important to check with the state health department before harvesting. Bacteria levels and biotoxins can accumulate in filter feeding shellfish, and can cause serious illnesses. To ensure all your shellfish harvesting and eating experiences are positive call the hotlines below to check for closures before harvesting.